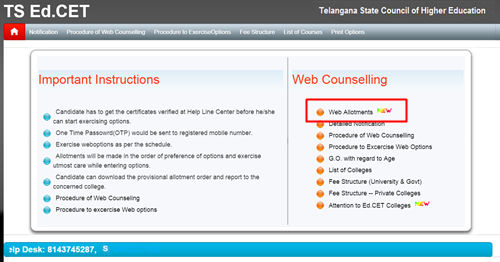 TS Ed.Cet 2015 Web Allotments are released @ tsedcet.tsche.ac.in, download telangana ed.cet allotment order download 2015. Telangana State council of Higher Education Released TS Ed.Cet 2015 Web Allotments at tsedcet.tsche.ac.in on 16-09-2015. Applicants Download your allotment Download by click on the below given link.